Ever since the funding for SETI, the Search for Extraterrestrial Intelligence, was effectively killed in the 1994 federal budget that cancelled the High Resolution Microwave Survey and terminated NASA’s SETI efforts, SETI has been reduced to looking through the results of other projects such as the volunteer distributed computing project, SETI@home. That is until now! Through the formation of the Breakthrough Prize Foundation, Russian billionaire Yuri Milner has just given SETI $100 million. Over the next ten years, the new initiative will be hiring prime observing time on the world’s premiere telescopes. The telescopes to be used are 50 times more sensitive than the best previously used for SETI. They’ll also be scanning 10 times more of the sky, over 5 times more of the radio spectrum – and they’ll be doing it more than 100 times faster. 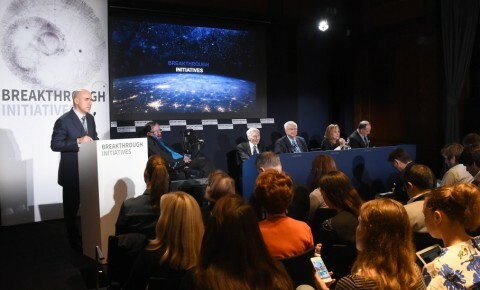 The initiative was announced by Milner on July 20th 2015 in London at The Royal Society, where he was joined by physicist Stephen Hawking, Astronomer Royal Martin Rees, SETI research pioneer Frank Drake, UC Berkeley astronomy professor Geoff Marcy and postdoctoral fellow Andrew Siemion, and foundation chairman Peter Worden. With all this new activity, who knows wat SETI will find. Let’s hope someone is working on a universal translator so we will have it ready when SETI gets that signal from some strange new world.